I'm constantly tweaking the way I do things. I think it's the scientist-in-training inside me that always wants to know if there's a better way to do something. When the new semester started near the end of January I had a small list of things I wanted to try to increase my productivity and decrease my stress. A few of them have worked out really well and I want to share them with you. Before the semester began I sat down and tried to figure out what my week would look like if I scheduled "blocks" to do certain kinds of work. I knew I had a couple constraints such as classes, sleeping (unfortunately), eating meals, and I knew I wanted to be finished with my work by around 7 PM each day (as much as possible). 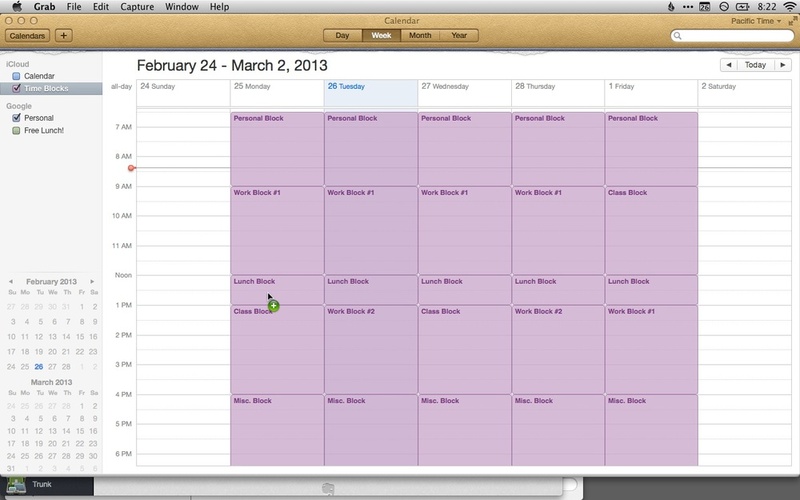 So, I sat down and created a calendar that looks like this. Each of the blocks in the calendar have an alert set for their beginning time. This has been helpful on two fronts. First, when I'm scheduling meetings or errands and in the day-to-day activities of my life. For example, I know that scheduling maintenance activities like picking up dry cleaning or going to the grocery store during my work blocks doesn't make a lot of sense. I'll try to schedule those during Meal blocks, Personal blocks, or the evening Misc. blocks. When I sat down and made this calendar I knew that my prime creative and productive time are in the morning and early afternoon (which is when my main Work blocks are scheduled) so I want to make sure I use those for the work that requires me to be at my best. The other way this has been helpful is through reminding me where I should be in my day. For example, I receive a notification on my phone when I shift from one block to another. If I'm feeling kind of low energy or not really sure what I should be working on it can be helpful to get a notification on my phone that says, "Work Block #1 starting now." It's a simple little nudge, but sometimes it's enough to get me on the right track. I've always known that clustering (or batching) activities was a good productivity trick. I try to sit down and do all my email at one time, or save all my receipts and input them once a week instead of doing them haphazardly. It struck me that I should be clustering other things as well. This semester I have classes on Monday, Wednesday, and Friday. Tuesday and Thursday are basically commitment-free. I decided I would try to schedule all errands and meetings for the days I already have class. I have to come to campus anyway on those days so it makes more sense to try to keep my Tuesdays and Thursdays as pristine as possible. Knowing I have two days a week that are completely wide open is a great feeling. I know I can sit down on those days and work nearly without interruption for 8 or more hours. Much, much better than having a meeting I have to attend in the middle of my day. This results in my Mondays, Wednesdays, and Fridays generally being pretty long and tiring days but the reality seems to be that this is less tiring than having meetings scattered about my entire week. I've been doing a Weekly Review every weekend for well over the past two years. This is an integral part of my productivity system and something I will probably do for the rest of my life. However, this semester I've added a new wrinkle to my review that has really helped me out. I use software to manage all of my tasks and calendar so I'm essentially paperless in my day-to-day life. However, I do carry a notebook everywhere I go. I decided to add a step to my Weekly Review where I look ahead to my upcoming week, take a look at my appointments, meetings, and other commitments, and try to schedule 2-4 areas to focus on each day. I will then write this plan into my notebook. 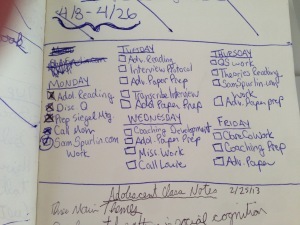 I don't try to slot them into specific times or anything -- they're just the domains of the tasks I want to finish to feel like I really accomplished what I set out to do.Weekly plan. Written out Sunday afternoon. As I work through the week I'll move these tasks around as I do or don't finish them, thus resulting in a fresh daily plan every morning. For whatever reason, getting the plan onto paper and out of my computer has really helped keep me on task throughout the day. Like seemingly most nerds I downloaded Mailbox and have been using it on my phone for the past few weeks. I'm still working it into my workflow but I think it's going to have a very positive impact. I'm also thinking about trying to move my Weekly Review into Friday afternoon (as opposed to Sunday afternoon) so I can keep my weekends even more free of work than I do now. I at least want to see what my mindset is like going into the weekend completely reviewed as opposed to going into Monday morning completely reviewed. I'll keep tweaking and will report back with any conclusions once they've been drawn. I'm always curious about how other people have done to improve the way they work. If you care to share, Twitter is the best way to reach me. Even better, write something up on your own blog and shoot me a link.